Your ship has run aground on a South Pacific island. Checking your nautical charts, you hope against hope that this is the legendary Lost Island, a land of untold riches and strange powers. As your band of treasure hunters eagerly explore your surroundings, you discover that the island is deserted other than some time-worn statues and vine-covered carvings among the ruins. Traveling deeper into the jungle, an apparition appears above a waterfall, offering cryptic explanations on how to enlist the aid of the Tiki Spirits to uncover buried treasure. This monkey god also warns you about the anger of the volcano god, which can be appeased only by making the required sacrifices upon demand. 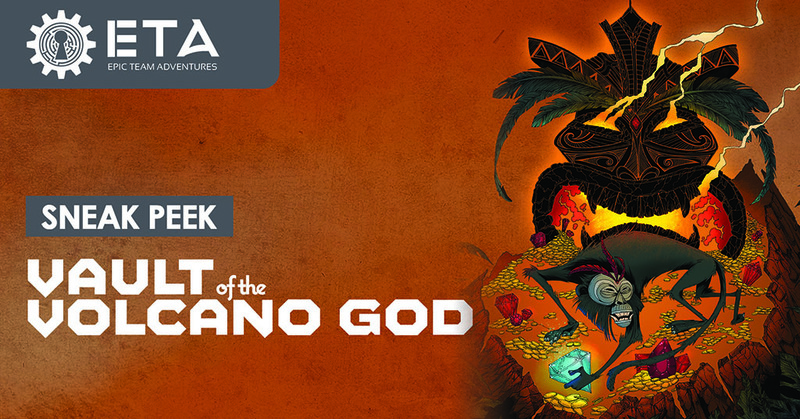 If you can satisfy the volcano god’s demands, you may return home with your collected wealth. Otherwise, you and your crew will perish as the wrath of the volcano god flows over the island. Vault of the Volcano God is an action-packed series of ten standalone adventures. Each adventure offers new areas to explore, thematic puzzles and activities, additional quests and missions, shifting demands from the Volcano God, and more details about the island mythology that can have game-changing impact. Instead of escaping at the first opportunity, your goal is to escape the island with the most valuable gems. Don’t think that there will be time to relax by finishing early. Tiki spirits will offer more quests than any team can complete. Only highly functioning teams that work together can succeed in unlocking the mystery of the island and fulfilling the mercurial demands of the volcano god. Booking for the first two Vault of the Volcano God adventures, The Break of Day and Burning Noontime, is open now. For more information and to follow the development of this series, visit www.epicteamadventures.com and subscribe to our email newsletter.